Director of FTMC Gintaras Valušis introduced the prime minister with research & development work and future perspectives of the Center. After a brief interview with the Head of the Center, the Prime Minister was invited to visit the research laboratories. S. Skvernelis visited the Center for Physical Sciences and Technology (FTMC) and got acquainted with the activities and modern laboratory equipment. The FTMC is the largest research institution in Lithuania performing unique research and development work in laser technology, optoelectronics, nuclear physics, organic chemistry, bio- and nanotechnology, electrochemical materials, functional materials, electronics and other fields of science. Not only has high-level education been developed here, but also modern technologies that benefit business and society. "The FTMC is setting the example for all institution, because the money invested in it is more than compensated. Today FTMC earns much more than receives from state funds. The FTMC once again proves that knowledge is the most valuable commodity, as well as the ability to capitalize on intelligence. And the courage to integrate different things often opens the door to unique ideas. 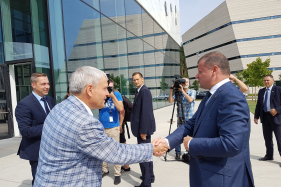 This center was founded by joining the Institutes of Chemistry, Physics and Semiconductor Physics and the Textile Institute and in less than a decade it has become one of the leading educational institutions in the country, "said Prime Minister S. Skvernelis. The FTMC carries out fundamental and applied research and experimental development studies in the fields of physics, chemistry and technology topical to the state, society and business. The Center not only carries out important research and development activities, but also provides doctoral studies, post-doctoral internships, trains scientists which are able to independently carry out world-level research and find ways to solve scientific issues. The research work commissioned by business, methodological or any other assistance, expert examinations and scientific advice create surplus value. Scientific knowledge is disseminated to the public, contributing to the development of an innovation-based economy and the development of a knowledge-based society. The FTMC brings together the best national scientists, it has modern laboratory equipment, so most of the scientific research carried out here is unique not only in Lithuania, and technologies created here are widely known not only in Lithuania, but also worldwide.